A lot of data is in the form of counts (whole numbers or integers). For example, the number of species in plots, the number of sunny days per year, the number of restuarants in towns, … With count data, the number 0 often appears as a value of the response variable. Zeros are difficult to handle in transformations. The Poisson distribution was made famous by the Russian statistician Ladislaus Bortkiewicz (1868–1931), who counted the number of soldiers killed by being kicked by a horse each year in each of 14 cavalry corps in the Prussian army over a 20-year period. The data can be found here, if you are interested. To fit a Poisson regression, we run a generalized linear model with the function glm(). formula = The formual, as normal, descrbing y as a function of x.
family = poisson sets errors = Poisson and link = log. The log link ensures that all the fitted values are positive. The Poisson errors take account of the fact that the data are integer and have variances that are equal to their means. 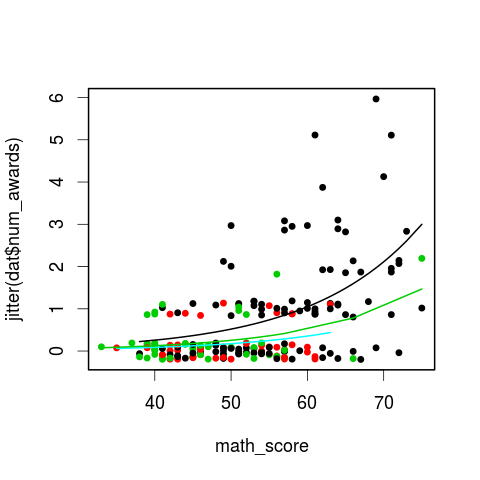 We will illustrate a Poisson regression with data on the number of awards earned by students at one high school. Predictors of the number of awards earned include the type of program in which the student was enrolled (e.g., vocational, general or academic) and the score on their final exam in math. 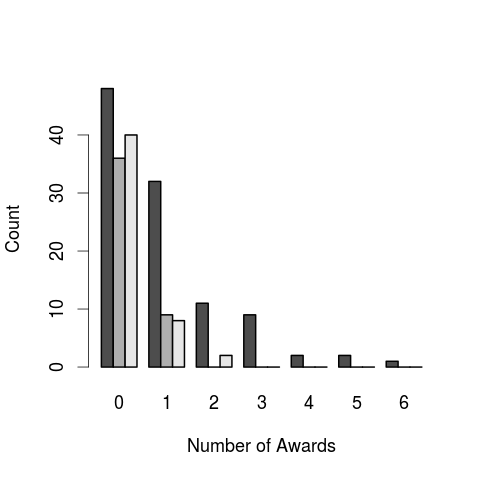 The response variable is the number of awards earned by each high-school student during the year ($num_awards). The predictor variables are each students’ score on their math final exam ($math_score, continuous) and the type of program in which the students were enrolled ($program, categorical with three levels: general, academic, vocational). The Poisson distribution assumes that the mean and variance of the response variable, conditioned on the predictors, are equal. We can check this. First, the unconditional mean and variance (i.e., the mean and variance of the whole vector). Second, check the conditional mean and variance (i.e., the mean and variance of the respose variable conditional on the levels of categorical predictors). Deviance Residuals: Deviance residuals are approximately normally distributed if the model is specified correctly. Here, it shows a little bit of skeweness since median is not quite zero. Coefficients: The Poisson regression coefficients, standard errors, z-scores, and p-values for each variable. For continuous predictor variables, the coefficient estimate is the expected log count of the response variable for a one-unit increase in a continuous predictor. For example, the coefficient for $math_score is 0.07. This means that the expected increase in log award number for a one-unit increase in math is 0.07. For categorical predictor variables, the coefficient estimate is the expected difference in log count between the baseline level (in this case, academic) and each other level. For example, the expected difference in log count for general compared to academic is -1.08. The expected difference in log count for vocational compared to academic is -0.7: students in general and vocation programs got fewer awards than students in academic programs. Deviance: The residual deviance can be used to test for the goodness of fit of the overall model. The residual deviance is the difference between the deviance of the current model and the maximum deviance of the ideal model where the predicted values are identical to the observed. The smaller the residual deviance, the better the model fit. First, we can eyeball this by checking if the residual deviance is similar to the residual degrees of freedom (it should be, because the variance and the mean should be the same). If the residual deviance is larger than residual degrees of freedom, this suggests that there is extra, unexplained variation in the response (overdispersion). Overdispersion can be compensated for by refitting the model using quasi-Poisson rather than Poisson errors. Second, we can explicitly run a goodness-of-fit test. If the residual difference is small enough, the goodness of fit test will not be significant, indicating that the model fits the data. We can test the overall effect of $program by comparing the deviance of the full model with the deviance of the model excluding $program. The two degree-of-freedom chi-square test indicates that $program is a statistically significant predictor of $num_awards, so we keep our original model. We first need to calculate and store predicted values for each row in the original dataset (we have enough data here that, at least for our purposes, we do not need to generate a new vector of math_scores). Now, we can plot the data points (adding some jitter to the counts, so that we can see the individual points), and add the predicted lines. Note: In the call to predict(), we could leave out type = "response". This would generate predicted values on the log scale, and we would need to antilog (exponentiate) them to get counts.